Directed by Joaquín and Julián Azulay. Argentina. 2016. 88 min. Spanish with English Subtitles. Surfing brothers Joaquín and Julián Azulay—aka the Gauchos del Mar—embark on an unprecedented expedition. 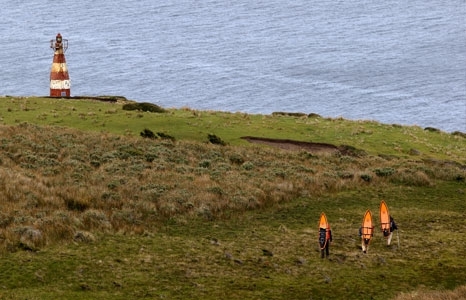 They set off on foot with heavy packs on their backs across the easternmost tip of uninhabited Tierra del Fuego Province. The brothers aim to surf a never-ridden world-class wave at the Cape San Diego Lighthouse, the most easterly point. To get there they overcome heavy terrains, scarcity of food and harsh climate for 53 days. With no communication whatsoever they document their journey and decide to share their message of environmentalism, avoiding consumerism and living simply in order to protect Península Mitre forever.